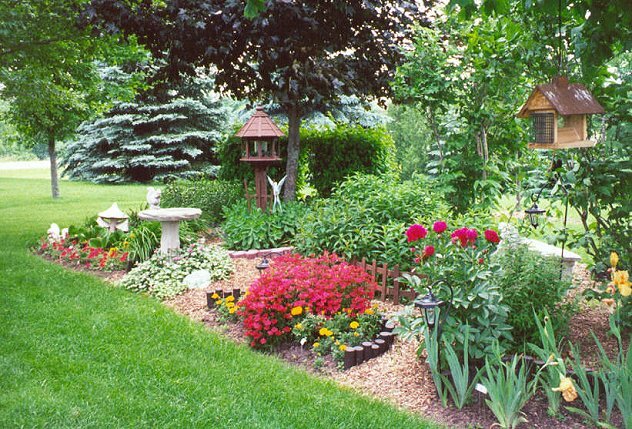 "Developing a bird garden in your own backyard is easy to do, relatively inexpensive, and will add value to your property. Most importantly, it could add enormously to your quality of life ... your daily connection with nature in all its beauty, wonder and fulfillment." Another view of my parent's bird and flower island in Brown County, Wisconsin. - Looking northwest out of their kitchen window. June 2002. We are working on a brush pile, woodpile, and more inviting or rustic backyard habitat for creatures here at our property in southeastern Wisconsin. A rabbit was hopping around our newly arranged brush pile this weekend. Yesterday I noticed a squirrel gathering dried leaves in its mouth and scampering up one of our front yard arborvitae trees. We hope "she's" building a nest.